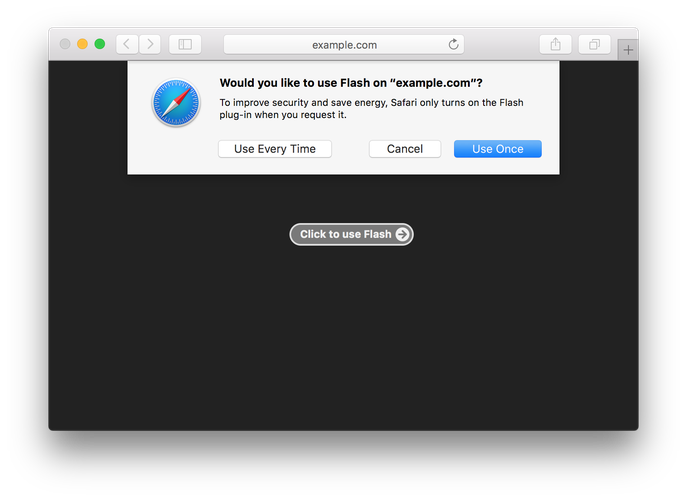 Apple's Safari is driving another nail in the coffin of Adobe Flash by no longer telling websites that offer both Flash and HTML5 that the plug-in is installed on users' Macs. The Mac maker is planning similar measures with other plug-ins like Java, Silverlight and QuickTime. This move will force websites with both plug-in and HTML5-based media implementations to use their HTML5, it said. When Safari 10, the new version of its browser, ships this fall, it will by default behave as though common legacy plug-ins on users’ Macs are not installed, wrote Apple software engineer Ricky Mondello in a post. “On websites that offer both Flash and HTML5 implementations of content, Safari users will now always experience the modern HTML5 implementation, delivering improved performance and battery life,” he added. For most websites that detect that Flash isn’t available, but don’t have an HTML5 fallback, a message that “Flash isn’t installed” will be displayed with a link to download Flash from Adobe. When a user clicks on one of the links, Safari will advise them that the plug-in is already installed and allow them to activate it just one time or every time the website is visited. The default option will be to activate it only once. The procedure is the same for other common plug-ins, according to Mondello. Google is adopting a similar strategy to promote HTML5 in Chrome by making it the default experience for websites, except for a white list of top 10 websites like YouTube.com and Facebook.com that use Flash. For the other sites that need Flash, a prompt will show up at the top of the page when the user first visits the site, giving them the option of running or declining to run Flash on the site. Google, Apple, Microsoft and other players are promoting the use of HTML5, which is seen to offer faster load times and lower power consumption. The Flash Player, once critical for rich media on the Web, also has a poor track record for vulnerabilities. Safari 10 can be tested by installing the beta of the upcoming macOS Sierra operating system, and will also be available as a beta for OS X Yosemite and El Capitan later this summer, Mondello said.